A belief in the supernatural world was felt strongly by the colonists of Norka. There are many stories of witchcraft or supernatural beliefs (Aberglaube) associated with the Volga Germans. Many of these beliefs had their origins in the German speaking areas of Europe where the colonists migrated from in the 1760's. The belief in the supernatural was held along with the religious beliefs taught by the church. This framework helped people understand what they saw and could not explain. The belief in witchcraft dates to the 13th century in Europe and the last executions of people convicted as witches took place in the 18th century. In Germany, sorcery remained punishable by law into the late 18th century, which coincides with the time that emigration to the Volga region in Russia began. Witchcraft came to be seen as a vast diabolical conspiracy against Christianity, and accusations of witchcraft led to large-scale witch-hunts, especially in Germanic Europe. The county of Isenburg-Büdingen, which was the ancestral homeland of many of the original colonists who settled in Norka, was a hot bed for witch trials. In the city of Büdingen, between 1532 and 1699 (peak years 1633-1653), 485 people (men and women) were indicted for alleged witchcraft, resulting in 400 executions. Dr. Timothy Kloberdanz, a noted authority on Volga German folklife, cautions that there is often confusion between those German-Russian individuals who truly practiced black magic (Hexerei) and those folk healers and midwives who engaged in white magic (Braucherei). 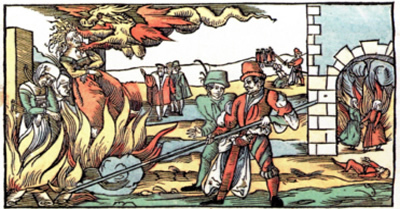 An illustration showing the persecution of witches in 1555. Source: Wikipedia (public domain). "Charges of witchcraft were primarily aimed at women, although some few men also fell under the net of suspicion. Times of crises brought out rampant accusations, whether it was the plague or economic ills or even crop failures. Women were particularly vulnerable victims since they were already outside the power structure of society and generally thought of in somewhat mystic terms for a number of reasons." "Witchcraft and evil spirits played a big part in people’s lives in all parts of the world and were feared by our ancestors too. I recall many people discussing different folk who were supposed to be able to hex people, livestock, or even crops. I am sure that today any of those fears could be explained away without abuse or insult to some poor old soul who was just different. I've heard of a woman named Hahn of Norka, who was supposed to be a Hex (witch) and livestock and chickens couldn't live in her, or her neighbors yard, but would just die off. Nobody seemed to wonder why she would hex her own livestock and keep replacing it with other. Probably the best explanation I could come up with today is, that this parcel of land was low and on the bank of the creek through the village and downstream from Faiglers leather tannery. When he emptied his vats of solution into the creek, people couldn't scoop water from the creek to water their plants in the yards, or the plants would die. Probably much of that solution flooded into the Hahn backyard and as it settled or dried, the chickens picking in it died from the settlings. Maybe the cattle in the yard had to drink of this polluted water, or the chemicals could have affected the grass there too. People had all kinds of gimmicks, which they believed would keep the Hex from putting the hex on them. Why they always singled out a poor old widow or old man as a witch is beyond any reasonable logic. I have heard people making statements when their young babies or grandchildren were suffering from baby ailments, such as "that old Hex was here visiting again this morning, now the baby won't sleep all night, but screams in pain and suffering." Some would place evil spirit fighting equipment under the babies’ pillow to ward off the evil spirits. I remember this one lady telling her daughter in law to put scissors, crochet hooks, knitting needles and several other items under the baby’s pillow. I now believe that the babies diet was the biggest factor to its unrest. When you recall how we all walked around chewing on a wedge of summer sausage, salami, or other spicy food item, it's easy to find reasons for a baby’s discomfort. Mothers usually gave a child a piece of wurst. Nobody thought about making sausage without spices just for the little one to eat. The fathers usually put an old horseshoe next to the door and each night when they retired they pushed it in front of the door to ward off evil spirits. We once lived in a house where the property owner had three houses on two lots and two Volga German families in each house. A non-German family moved into one of the sides when it became vacant and the moving family had left an old horseshoe lying by the door when they moved. There were six sheds built together behind the houses, one for each family. The sheds were all as one building, with partitions and separate doors. The man picked up the horseshoe and took it out to the shed and was nailing it, toe downward over the shed door, when I walked out to get acquainted. I asked him why he was nailing the shoe over the door and he explained that by placing it there with the opening up, good luck from above could collect there and filter into the owner’s life. I went right in and got my horseshoe from behind the door and nailed it over our woodshed door, figuring, instead of keeping the evil spirits out of the house, with all the good luck coming into the shoe we wouldn't need to worry about the evil spirits, besides it was just a dumb belief someone started drous (in the old country)." wenn ich in Himmel werd eingeh'n. Professor Gebhardt was taught that reciting the hymn would protect him from hexes throughout the day. Another method to prevent evil spirits from entering a place was to write the words of the above hymn backwards and nail it above a door. Gebhardt also wore a talisman known as a Seetelja which was a triangle shaped packet with a tab that was made from a small and clean piece of white cloth. The Seetelja was pinned to a mattress or underclothing through the cloth tab. The Seetelja was filled with Asafoetida, called Teufel's Dreck (Devil's dung) in the dialect. Asafoetida is a gum resin of a root plant and is used as an ingredient in Indian cooking. The gum is edible but has an unpleasant smell until it is cooked. The Seetelja was made by a woman who invoked the Trinity with each stitch. As a child, Charles was admonished to avoid certain older women in the neighborhood who were hexes. He recalls that avoiding witches, along with concealing his Seetelja during gym class, were not problems encountered by his non-Volga German classmates. Other talismans were available for use by the average person to guard against hexes, including the hanging of magpies (Atzeln) in the barn or hanging eels, fish heads or horseshoes (the open end had to be pointed down). Professor Gebhardt began collecting a large number of Hexerei stories in the early 1950s, specifically from people who had lived in the neighboring colonies of Huck and Norka. One such story was provided by a man from Norka who was living in Portland, Oregon. Gebhardt translated this story from the Norka dialect. There once was a man from Norka from a family named Feuerstein and they also believed in hexes. And as they drove up to the Russian hills, the horses stopped pulling. They unhitched the horses and took an iron fork and stuck it in the spokes. They then hitched the horses again and drove on and the hex was no longer there. Another story was told to Gebhardt by another man from Norka living in Portland. There was a man, you know, who had a toothache. He was told that the toothache would go away if he went to the cemetery between one and twelve o'clock and pinched off a piece of a cross with his fingernails. He was then told to stick the tooth three times with the sliver in the name of God and the toothache would go away. He did this and if the toothache went away or not I don't know. Sorceresses and fortune tellers could also be found in the colony and they were nearly synonymous. Both could foretell the future and "read" the cards. A sorceress could also read palms and determine the character, occupation, future, and year of death of her client. In most cases, a sorceress was a foreigner, and often a Gypsy who who visited the village. The sorceress could make general predictions about the happiness or unhappiness of those who paid for her services. The fortune teller was a home-grown colonist and a hidden part of the life of those who used her services. She could predict the future in the smallest detail including the girl's time of marriage, the character of her future husband, the number of male and female children she would have, and whether or not she would be happy. The role of a male fortune teller was more complex than that of the female. He was used on fewer occasions and for more serious events such as illness, death, murder, and major theft. Being part of the community, it was usually not difficult for him to assess the situation and predict the future events. There were others in the village who were sought out to interpret dreams. These people often derived their wisdom from Biblical dreams and interpretations. It was common to predict the future based on signs. Weather for the next year was often determined by its relationship to Christmas Day and the following days. For example, January weather was predicted by the actual weather on December 25. February's weather was predicted based on the actual weather on December 26. This method continued until all twelve months were forecast. Heavenly events foretold of special occurrences. An unusually red sky signals the coming of a bloody war. Solar or lunar eclipses foretell a bad harvest or epidemic. The appearance of certain stars foreshadows revolt or revolution. Twinkling stars announce the coming death of a well-known person. Birds and other animals also served as oracles. The number of times a cuckoo bird first cuckoos in the spring tells one how many years they will live. The cry of a night bird foretells unhappiness. If a flock of magpies lands on a house, someone is sure to die. If a dog rolls on its back, there will be a snowstorm and wind. If a cat crosses a road, unhappiness will follow. If a cat washes itself, there will be guests. If a spider drops in front of someone, a letter will come. Accidents could also serve as signs. Break a dish, happiness. If a knife or fork fell to the floor, guests will arrive. If the left palm itches, a person will receive money. If the right palm itches, one will pay money. ​The colonists believed strongly in visible and invisible spirits (Gespenster). The souls of the departed who had not received release in afterlife were thought to wander about the earth and appear to people. The souls of the murdered and tortured would periodically appear in the homes of their murderers or tormentors until the guilty repented. There were also kind spirits who appeared in homes and lived there unseen to calm and help the living. Volga German historian Jacob Dietz states that the belief in superstition amongst the colonists "was instilled in the dark soul, and it resides there equally with faith in the divine." Note: The above material makes two contrary references to the the direction a horseshoe is to be hung. Each German community may have had different beliefs as to which direction brought good luck as explained in the following article, Horseshoe Superstitions, Good Luck Up and Down. Brill, Conrad. "Memories of Norka." Interview by George Brill. n.p. Print. Dietz, Jacob E. History of the Volga German Colonists. Lincoln, Neb. : American Historical Society of Germans from Russia, Printed by Augstums Printing Service, 2005. 369-377. Print. Kloberdanz, Timothy J. The Daughters of Shiphrah: Folk Healers and Midwives of the Great Plains. Lincoln, Neb. : Great Plains Quarterly, 1989., pp. 3-12, Print. Moss, Harold J, and Catherine Bauer. [Catherine Bauer]. Nebraska, 1938. Pdf. Retrieved from the Library of Congress, <https://www.loc.gov/item/wpalh000989/>.